I have this tool on a few Swiss Army knives (though I think I've seen it on other multi-tools as well). What is it and what is it for? On one edge, it has a sharp edge. It also only opens halfway (as seen in the photo). It is a "reamer with sewing eye", according to Victorinox (PDF). That is a "punch/reamer". It allows your to repair leather (for example). You thread a thread of something though the hole and then use the sharp end to punch/push the thread though leather. In this way you can repair boots, etc. The tool has two purposes. As a punch, it acts as a large needle. You can use it to sew leather or canvas, as mentioned in the other answers. Punch the tool through your fabric, put thread through the hole, retract the tool, repeat. As a reamer, the non-uniform blade shape allows you to make quite good circular holes in plastic or wood. Punch the tool through, then rotate it to carve off a small circular sliver. Rotate again and again and again, adjusting position, to carve a fairly even circle. How to sew with a swiss army knife? What is not obvious, upon first viewing, is that after you first get the thread through the first hole, you should always have half of your thread on one side of the hem and half on the other. I use the punch while hunting to dispatch wounded birds. Simply hold the bird by the neck/head and push the punch into the back of the bird's head. It's quick and humane. I have never used it to sew since I have a better tool for that. Not the answer you're looking for? Browse other questions tagged knives swiss-army-knife or ask your own question. Why do some knives have one-sided sharpening? 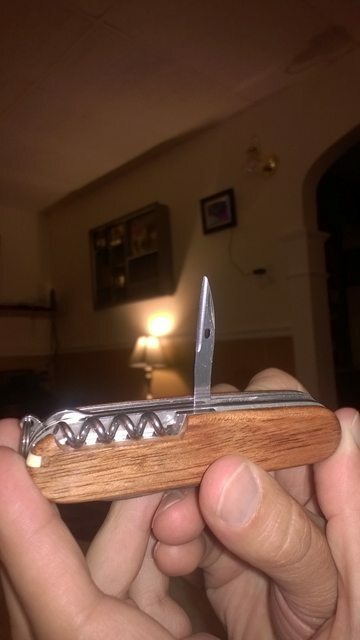 What is the use of the saw blade on a swiss knife?